However, that person who you’ve hired will not be a permanent employee of your and is only meant to complete the task that only he/she can do. 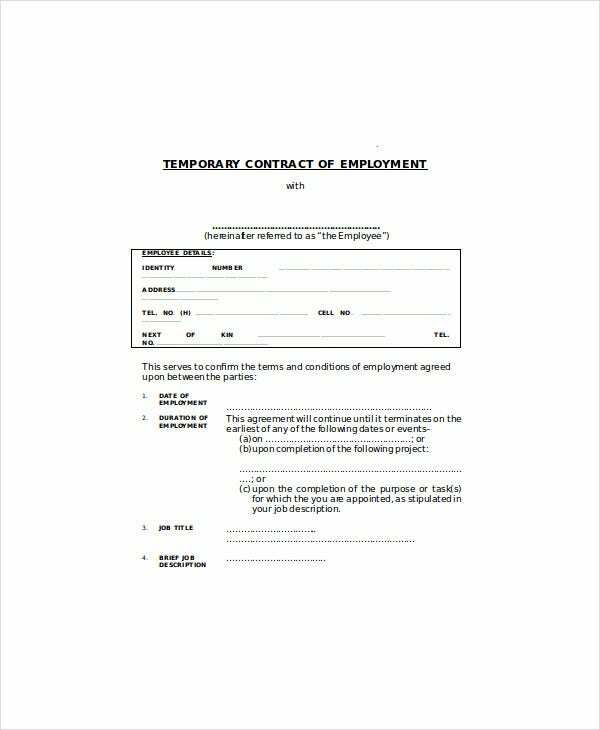 To ensure that this person understands that, you will need to come up with a temporary employment agreement contract and this article will teach you how to make one. You cannot create this type of document unless you know all of the pieces of information that it will require. The contents of a temporary employment contract should contain all of the necessary information that one needs to determine who the temporary employee is, what job needs to be done, when the job needs to be completed, etc. Nobody wants to sign a contract if they don’t even know who they’re going to be working for. So let’s say that you’re the one in charge of the business project and you wish to hire this particular person for the job. You’ll have to state the complete name of the company as the employer within the agreement contract. This section also has to contain a statement sample where it says that the company will be referred to as “the employer” within the contract. This ensures that the work that needs to be done has indeed been issued by the “employer” in this case is the company that hired the temporary employee. If you’ve already considered someone who will take on the job and that the two of you have already come to terms on how it’s going to go, you may then write down that persons’ complete name into the document. This ensures that the person’s name listed down within the document is the one that will be tasked to do the specific services that the company will require. Also, remember that you write down this person’s complete name (last name, first name, and middle initial). Be sure that you don’t spell out the temporary employee’s name incorrectly as you will need to keep this document on employee record. The reason why you’re going to need these pieces of information is that you need to be able to contact the temporary employee whenever the occasion might arise when you need to. By having both the temporary employee’s address and contact details written down in the contract, you’re ensured that you have some means of making contact. Because let’s say that the employee is not responding to your calls or your emails, knowing the address will come in really handy as you can send someone over to inform the employee regarding a certain matter. So you will need to require the temporary employee to write down the complete address. That should be everything from the street number, house number, block number, apartment or room number, etc. If the employee has more than one address, then ask him/her to put them in the document. Also, ask that he/she provide you with the mobile and phone number, as well as his/her email address. Remember that this is just a temporary number that you will be handing to the temporary employee until he or she finishes whatever tasks that you’ve given. No matter where the service will be provided, whether it’s an outdoor or indoor project for your company, the temporary employee will need to gain access to the establishment. By giving this person a temporary I.D cards, then he/she will be able to freely enter your company building or the area in which he/she has to do the service stated in the contract. Also, you’ll have to state in the document that the I.D number is also temporary and will only last until the temporary is finished with whatever he/she is tasked to do. You’re going to have to be specific when you’re going to write down the date in which you decided to hire the employee. The date of employment will signify that the temporary employee will start providing you with what your company needs on the day that’s stated in the contract. 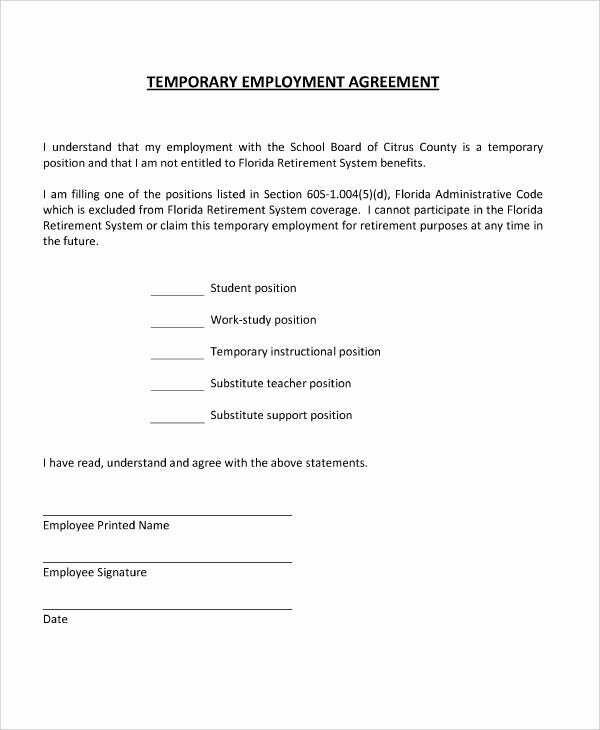 There may be certain situations where the temporary employee will need to provide his/her temporary employment, so having this in the document is a must. 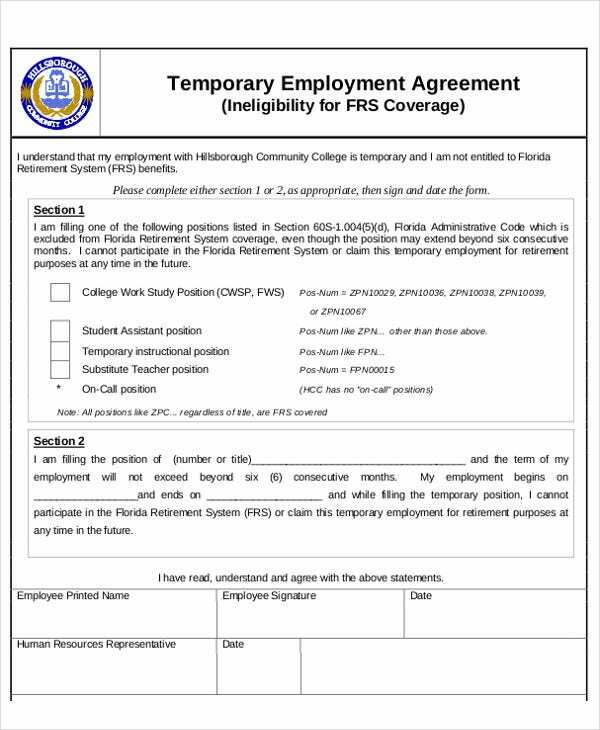 Considering the fact that this contract template is one for temporary employment, there has to be a set date for when the temporary employee’s status will be revoked. This will all depend on the employer. If the company thinks that the temporary employee will need to stay with the company until the project is finished, then all one has to do is say that within the agreement contract. If the task that the temporary employee that needs to be done can be finished within a matter of days, then place in the agreement contract just how many days the temporary employee has until the completion of the project and that his/her status a temporary employee will be done by then; regardless as to whether or not he/she finished the daily tasks. Considering that this is for temporary employment, you want to write down what it is the temporary employee is going to be doing while he/she is working for you and your company. Be sure that when you’re writing down these services, they’re all written in a clear manner that will let the temporary know what he/she has to do. If you have more than one service that needs to be provided, then place that in the agreement contract. 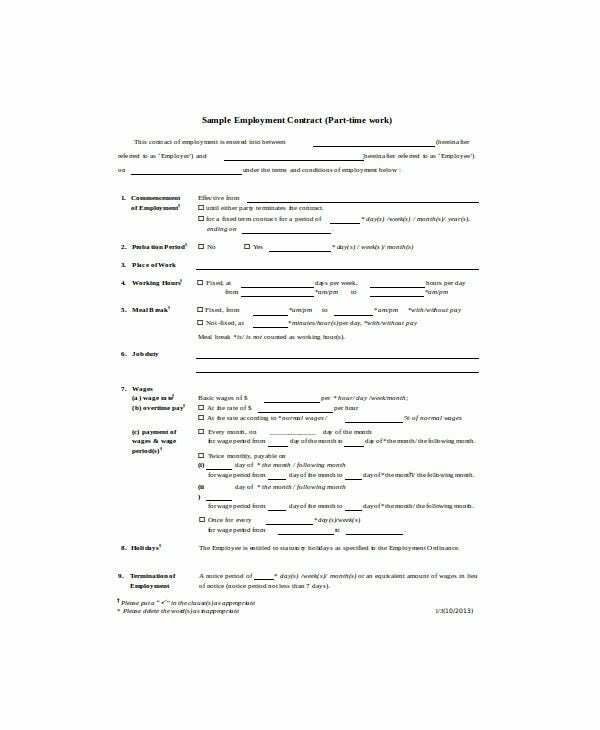 You may also like employment separation agreement templates. Nobody wants to do work unless they’re paid for it. You will need to state how the temporary employee will be paid. So let’s say that you’re charging the temporary employee by the hour, this would mean that you’re going to have to write down the exact amount of money that your company will pay the temporary employee for every hour that passes while he/she is providing the service. If the temporary employee will be paid based on the type of service provided, then the agreement contract will need to state what these services are and the prices for each. 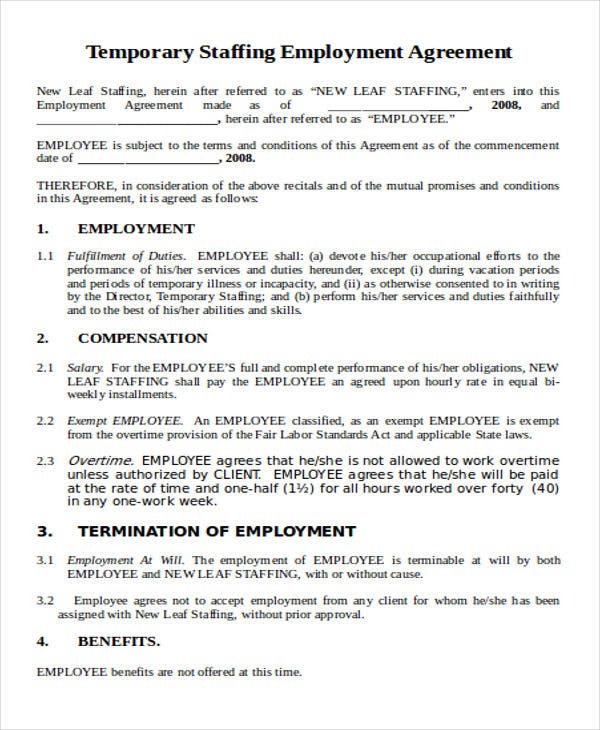 You may also like employment agreement templates. There might come a point where either the employer or the temporary employee will either no longer need the service or is no longer able to provide the service. In the event that this should happen, it’s best that either party writes down a notice of termination to ensure that both are well aware. Be sure that you clearly state that either party must hand the notice within at least a 30 day time period before the completion of the service. Although the duration will entirely depend on the type of work that you need the employee to do, the number of days that either party has to submit the termination notice must be a couple of days or weeks ahead of the service’s completion. There’s always going to be that possibility wherein the employer might require the temporary employee to provide further work for the company. If that were to be the case, the temporary employee won’t just accept these extra jobs unless both parties can come up with another agreement which involves these extra services. This is why the contract will need to contain a statement which says that any additional services that the employer will require the temporary employee to do must be written in a document. Also, the document must be signed by both parties to ensure that the two have come to terms with the additional work that has to be provided. This is useful for both you and the temporary employee so be sure to have this in the document. You may also see employment agreements. This is basically a way of guaranteeing that the temporary employee will see that he/she will do everything possible to complete whatever tasks you have assigned. Having this within the agreement contract will prove to be very useful as it acts as a form of security measure for your business. Because in the event that the temporary employee is not performing in the way that you want, you can state that the employee will not be compensated should he/she not complete the job. 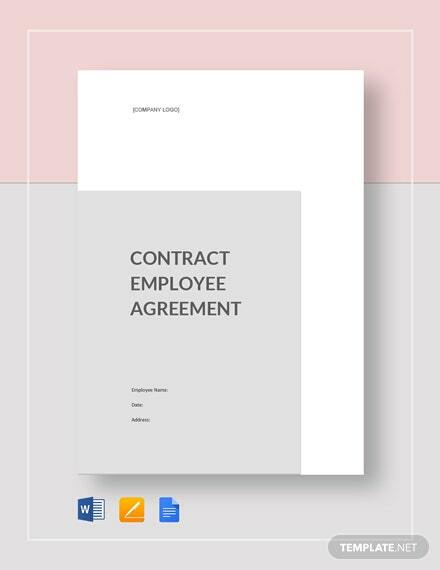 You may also like employee agreement samples. Even temporary employees need to have some perks while working for a company. You can state in the contract agreement that while the temporary employee is under the company, he/she can have access to facilities such as the employee lounge, the main building, company restrooms, etc. Also, be sure that you state in the agreement that all of these perks will no longer be applicable once the temporary employee’s contract is finished. The temporary employee may gain access to certain data that are vital to your business. You don’t want that person to spread that information around to your competitors, so the best way to prevent that is to include a confidentiality agreement into your document. This ensures that the temporary employee will not share the information with others, and you can state the proper legal action will be taken should the temporary employee decide to break the agreement. If you would like to learn more on how to create a temporary employee agreement form or anything similar, then all you have to do is find the right articles on our site and use whatever information you’ve been able to gather to help you and your business out.